The opening track “Ever” on the band Flipper’s classic first album, Album, contains the lyric, “Ever look at a flower, and hate it?” As I was playing Satisfactory, the new game from the developer of Goat Simulator, I realised that lyric pretty much sums up what the game is about. 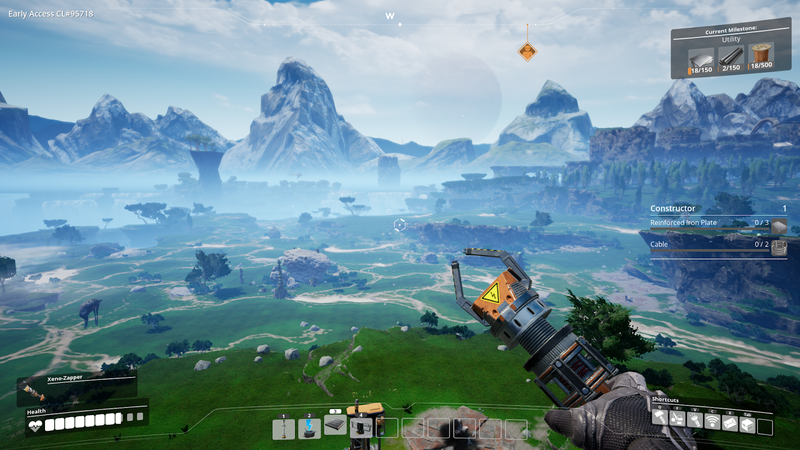 While Goat Simulator was about chaos, Satisfactory is about control. 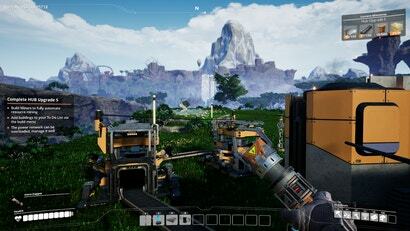 Available now in early access on the Epic store, Satisfactory is a base-building and resource management game in line with Oxygen Not Included. It plays a little bit like Minecraft for adults, given its first person perspective and checklist style gameplay. You play as a representative of Ficsit, a megacorp that wants to you rob an alien planet of its natural resources in order to build increasingly complicated machines. As you play, you gain the ability to craft more and more buildings that help keep your assembly lines efficient. The planet you land on in Satisfactory is gorgeous. It’s completely unspoiled nature, and you’re greeted with the local fauna as soon as you land. There are lumbering giraffe-like creatures, giant flying reptiles with pale blue wings, and some slightly annoying giant armadillo-esque animals that guard mineral deposits. You’re here, on this lovely, calm, peaceful planet, to fill its vistas with machines belching black smoke. It’s not exactly a secret that your goals are ignoble. It’s clear that Ficsit doesn’t really care about you. If you’re injured by a long fall or an attacking animal, you don’t get an alert that your health is lowering, but rather an alert that the equipment you’re wearing is being damaged. The AI that guides you through the tutorial is a bit like Glados from Portal before her evil nature is revealed. She’s dry, unfeeling, and definitely unconcerned with your continued survival. Despite my discomfort with destroying nature for the needs of an uncaring corporation, the streamlined efficiency of production keeps me coming back. Satisfactory presents the tantalising idea of creating a perfectly tuned system that always does exactly what I want it to. I found the game most irresistible once I unlocked conveyor belts. Most of the buildings you can build have an input and output, meaning they can be connected by conveyor belts to each other. That means that you can connect a mining machine to your ore deposit, have that travel via conveyor belt into a machine that makes it into iron ingots, and then travel from there to a machine that makes it into iron rods, which you can use to craft other machines. I started thinking about the possibilities as soon as I got my first chain of buildings up and running. Now that I have the ability to split conveyor belts, I can have half the ingots turn into another crafting material, and maybe eventually rejoin the belts to make a third crafting material. It’s hard to tear myself away from Satisfactory. Playing co-op mode is seamless, and playing multiplayer with video producer Paul Tamayo today also showed me how much more efficient everything is with two people. If I had a full squad of three other players to help me out, I could ruin this planet in no time. It's a great game so far but the open ended nature soon feels a little pointless. Factorio at least had a goal. I'm hoping this gets one too. I'd love to see either a tower defense style aspect to it, a financial mode in it, or a competitive factory vs factory mode maybe on the same map? But, that said, it's damn well made. Hopefully it will have something like that by the time it comes to Steam. Factorio has been out for a while and has had a fair amount of updates. So comparing the two (while merited) is a little unfair. The game at this point is a great base that can be added to. For early access it is quite solid currently. Lot of fun, and the scale of it all is pretty incredible. The moment I had to cut a tree down after lodging my truck in the top is probably the pinnacle of my prowess thus far... That or accidentally putting my chainsaw in a container and thinking I'd lost it, only to find it 10 minutes later traveling along a conveyor belt.